Back in February, I learned that Sparkers had won the Friends of American Writers’ Young People’s Literature Award. Friends of American Writers is a Chicago organization dedicated to the promotion of literature, and each year they award prizes to adult and children’s books with a Midwestern connection. At the end of last week, I traveled to Chicago to attend the awards luncheon. This photo is from Quiz Bowl Nationals in 2008. I arrived the evening before the luncheon, having procrastinated all week on preparing my acceptance remarks. (It’s shocking how little useful material one finds when one Googles how to give an author award acceptance speech. Then again, I was probably making a mountain out of a molehill. This wasn’t the Oscars.) Over some rather chemical-tasting mac and cheese, I reviewed my single page of brainstorming and was forced to acknowledge what I’d suspected all along: a laundry list of connections between my life and relatively minor facets of my book did not make for interesting remarks. Everything scrawled on that sheet of paper was trivial. Nobody would care that, like my main character, I enjoyed trying to teach myself languages and, oh, hey, when I lived in Paris as a thirteen-year-old I read Argentinian comics about a girl named Mafalda in order to learn Spanish. Whatever I said needed to have some sort of arc, or at the very least a unifying thread beyond all the languages I tried to teach myself in my youth. I had an inkling of another idea, but I was hesitant to go there. The more I thought about it, though, the more it felt like the right, even the inevitable, choice. I knew if I stuck with my collection of not-actually-all-that-quirky anecdotes, I would probably be a bit of a flop. If I embraced that other idea that beckoned, on the other hand, I might be able to say something that actually mattered. What was that other idea? Roughly, it was the social justice aspect of Sparkers. As I said in the remarks I eventually gave, this is the number one thing readers mention in their online reviews, yet I have rarely discussed it because I’ve had trouble coming up with anything thoughtful to say about it. But a review I had seen just a week before flying to Chicago had praised Sparkers for its great connection to current events in Baltimore, MD and Ferguson, MO. The day I was stewing over my speech, the news broke that the Justice Department would be conducting an investigation of the Baltimore police. I’ve been humbled by the numerous reviews like the one just mentioned and have felt like I don’t deserve the credit I’ve been given for addressing timely issues through children’s fantasy, but on the eve of the awards luncheon, I felt it was time to own the parallels people had been drawing between my book and real-life injustice. I left the restaurant, got myself some ice cream, and went for a walk in Grant Park, across from my hotel. Crabapple trees (or the like) were in flower, their blossoms fragrant in the evening air. 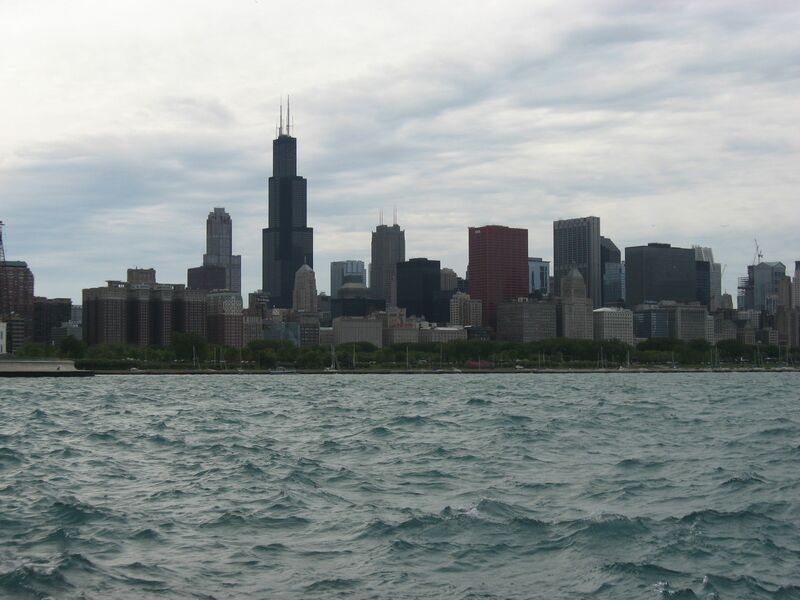 I admired Buckingham Fountain and the Chicago skyline rising behind my hotel, then turned around to look out across Lake Michigan, which was mostly just an expanse of gray nearly indistinguishable from the darkening sky. At last, I returned to my hotel to prepare the speech I had now resolved to give. I finished writing it at the actual eleventh hour, and before going to bed, I wondered if I was really going to go through with this. Was I really going to open my remarks by mentioning two inquiries into racial bias in city police forces that I had literally pulled from the headlines that evening? Was I really going to say that the oppressive, unjust world I had invented as a teenager no longer looked so different from present-day U.S. society to me? Was I really going to name Mike Brown, Tamir Rice, Walter Scott, and Freddie Gray in front of an audience I knew almost nothing about? I’d realized as I was coming up with things to say that Sparkers contains an incident of police violence right in the first chapter. Not that I’d forgotten, exactly, but I’d never before considered this scene in the context of this last year. In my remarks, I made the connection explicit. I was sure I had chosen the right topic, but I was mildly terrified of actually speaking. What if the people who were giving me this award were offended when I said oppression and injustice still existed in the U.S.? What if they thought I was being too political? Did I really have the right to talk about Mike Brown and Freddie Gray? I was still wondering the next morning. The awards luncheon was held at the Fortnightly Club, a handsome brick building that was the epitome of gentility on the inside. The dining room had chandeliers and a high ceiling painted like the sky. I met various members of the Young People’s Literature Award committee, who told me how much they’d enjoyed Sparkers. Two of the four other award winners were also in attendance, and I met them at the signing table before lunch. In keeping with the award eligibility criteria, we were all Midwesterners by upbringing. Remarks done, I was able to enjoy the delicious luncheon (dark and white chocolate mousse!) and the other authors’ acceptance speeches. Somebody else was the (requisite?) funny speaker (I learned what not to do when a Hungarian mathematician tells you your three-year-old daughter is a prodigy and should be doing algebra), and I was glad I hadn’t tried to be funny since I would have failed. And just before heading back to the airport, I got signed copies of Last Night at the Blue Angel and The Mathematician’s Shiva, which I am eager to read. In conclusion, if anyone ever lands on this post because they Googled how to give an author award acceptance speech, here’s my advice: follow your instincts, dare to take risks, weave in what your book is about, and make sure you have some kind of structure and/or direction.